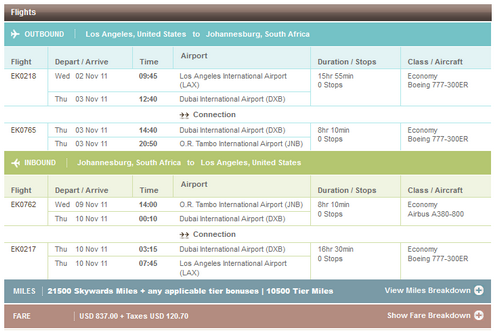 The Flight Deal | Emirates: New York/Los Angeles/Houston/San Francisco – Cape Town/Johannesburg, South Africa. $778 – $957. 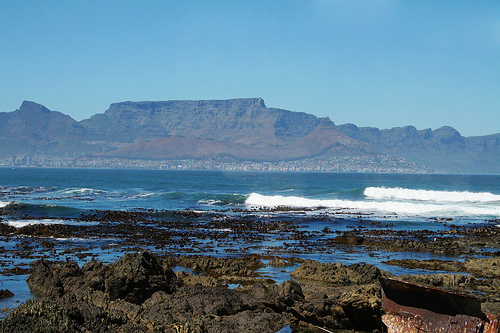 Emirates: New York/Los Angeles/Houston/San Francisco – Cape Town/Johannesburg, South Africa. $778 – $957. Simply an awesome fare! We haven’t seen under an $800 airfare to South Africa since Iberia’s mistake $700 fare to Johannesburg last year. But this is not a mistake, this is an Emirates Airlines flash sale! November 2nd – 9th. Valid until November 30th. Must purchase by October 12th, 2011. Emirates has a reward program and you should sign up for it when buying this. An itinerary to form Los Angles – Johannesburg would earn 21,500 Emirates points.